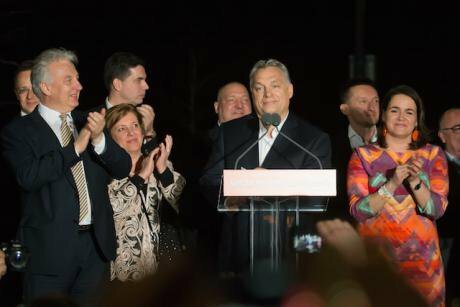 Hungary's Prime Minister Viktor Orban delivers a speech after his ruling Fidesz-KDNP coalition won the general elections in Budapest, Hungary, on April 8, 2018. He thanked Hungarians for having "saved the country." Attila Volgyi/Press Association. All rights reserved.Viktor Orbán secured his third definitive victory on April 8 in Hungary’s parliamentary elections. Although Hungary was praised a decade ago for being a prime case of successful democratisation and free market reform, now it is another example of liberal institutions sliding towards autocracy. The fierce anti-migrant hate campaign was the most visible sign of the length to which Orbán was prepared to go to ensure his majority. Since 2010 Orbán has been using the momentum created by popular anger at the failures of liberal policies to build up his own system: authoritarian capitalism. A system that is deeply illiberal but capitalist: private property and the profit logic still dominate, but the state bureaucracy and its institutions are subdued to the enrichment of the preferred national economic elite. Borrowing from Bourdieu, it abolishes the left hand of the state and uses its right hand to repress dissent and discipline citizens. Understanding the success of the authoritarian turn in Hungary offers lessons for the future of democracy and liberal, tolerant, open politics worldwide. We can start by traveling back to the 1990s and 2000s to witness the social and economic impact of liberal economic reforms. Chronically low employment and substantial deindustrialisation were the defining characteristics of the Hungarian economy after the fall of socialism. A large segment of society, the early victims of the transition – the elderly, the young with little education and those living outside the biggest towns of the country – could not take part in the new growth centres of the economy dominated by technology-intensive transnational companies. Those outside the local hubs of the global economy felt increasingly left behind. Hungary has also been characterised by painfully low wage levels that lagged behind Central and Eastern European wages throughout the last thirty years. Low wages, lost jobs, and high indebtedness made the Hungarian working middle class extremely fragile. As a result, social tensions grew and the approval rates for post-socialist liberal capitalism dropped dramatically in the first twenty years. These tensions and disillusionment swept the working middle class to the Right. Blaming citizens for their alleged populist or anti-democratic turn, however, is misleading. Without the consent and even active involvement of the economic elite, authoritarian capitalism could not have emerged in Hungary. Throughout the 1990s, post-socialist governments attracted high foreign investment into the country, luring transnational companies with low corporate tax and generous tax allowances. As a result, the economy became divided into two parts: an effective, export-oriented and capital-intensive transnational sector creating only a handful of jobs, and a stagnant national business sector, with little connection between the two. This highly dualistic economy created a polarisation within the economic elite leading to divergent political interests and preferences. Orbán’s authoritarian capitalism was built on securing the support of the national capitalist class by positioning the state against the coalition of transnational companies and their centrist-liberal political allies. These national capitalists consider Orbán’s state as a new opportunity to redefine the terms of the game set during the 1990s. The state directly enriches the national capitalist class by intruding into the existing property rights of international capitalists, creating new lucrative opportunities from the top and securing the supply of cheap and flexible labour. However, Orbán also knows that he cannot fundamentally challenge major international investors, so he attempts to pacify them through strategic partnerships and a record-low 9 per cent corporate tax. As a result, Orbán’s authoritarian capitalism enjoys the support of the majority of the economic elite, both foreign and domestic. To satisfy the needs of the economic elite, Orbán not only dismantled crucial democratic institutions, but also silenced those who could get in the way, such as trade unions and NGOs, as enriching this new elite necessarily creates losers. Although Orbán won in 2010 with the support of the working middle class, his neoconservative authoritarian policies favour the upper middle class and the economic elite. Between 2014 and 2018, real incomes and the employment rate have risen somewhat, but the bottom forty per cent has remained on the losing side of Orbán’s economic policies. To prevent a backlash from those who have lost out, Orbán uses the authoritarian state as a disciplining tool. He controls the economically vulnerable population from above, by using their fears of losing access to public works and other public services and benefits. Another way the authoritarian state secures the consent of the economically vulnerable is redirecting distributional conflicts along cultural lines. He attacks the unworthy, undeserving poor and immigrants with hate campaigns to pose as the saviour of the nation. Targeting George Soros in the most recent parliamentary election was a strategic move to connect the enemy images of the reckless global investor and the fearful migrant, portraying both as threats to the vulnerable working class. Orbán’s authoritarianism cannot be separated from the model of capitalism he builds. The authoritarian counter-reaction to the failures of post-socialist liberal reform shows that there is nothing inherently democratic in capitalist arrangements. Fidesz is able to use voters’ economic anger and exploit the divisions in the capitalist elite to ensure the stability of the regime. Yet, Hungary is not an outlier, but a frontrunner of a global tendency that Mark Blyth describes as “global Trumpism”, which utilises the anger and psychological insecurity of the rural working class to revolt against the liberal status quo. Orbán’s regime is at the endpoint of this revolt, showing that authoritarian capitalism can be installed even in a formerly democratic state. The only way out is a new progressive political identity that offers security against market imbalances and psychological insecurities. This identity will not gain a foothold without political organisations that are deeply embedded socially. Progressives therefore need to refocus on community organising as opposed to the technocratic management of society. Implementing new policies that will lead to a democratic developmental state is certainly part of the solution. But reinventing progressive analysis and political organising is the most important first step against the spread of authoritarian capitalism throughout the world. A much fuller version of this article is published on TNI’s website.